You'll be £12.99 closer to your next £10.00 credit when you purchase Trench Art - Second Edition. What's this? Engraved shell-cases, bullet-crucifixes, letter openers and cigarette lighters made of shrapnel and cartridges, miniature aeroplanes and tanks, talismanic jewellery, embroidery, objects carved from stone, bone and wood – all of these things are trench art, the misleading name given to the dazzling array of objects made from the waste of war, in particular the Great War of 1914-1918 and the inter-war years. And they are the subject of Nicholas Saunders's pioneering study which is now republished in a revised edition in paperback. He reveals the lost world of trench art, for every piece relates to the story of the momentous experience of its maker – whether front-line soldier, prisoner of war, or civilian refugee. The objects resonate with the alternating terror and boredom of war, and those created by the prisoners symbolize their struggle for survival in the camps. Many of these items were poignant souvenirs bought by battlefield pilgrims between 1919 and 1939 and kept brightly polished on mantelpieces, often for a lifetime. Nicholas Saunders investigates their origins and how they were made, exploring their personal meaning and cultural significance. He also offers an important categorization of types which will be a useful guide for collectors. 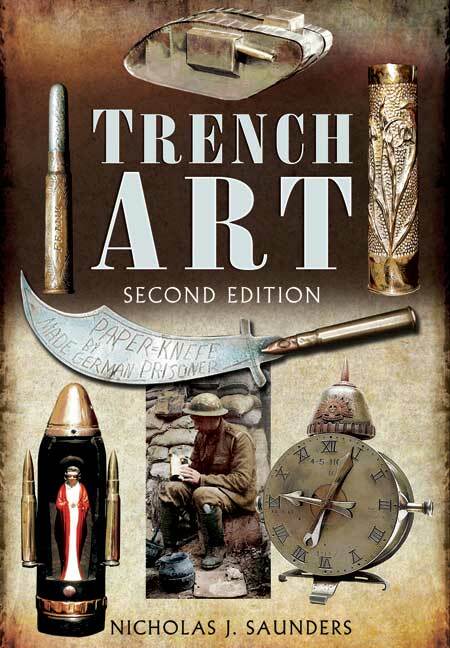 This book is a concise history of trench art.